↑ Volk, B; Barkóczy, J; Hegedus, E; Udvari, S; Gacsályi, I; Mezei, T; Pallagi, K; Kompagne, H; et al. (2008). 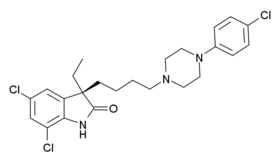 "(Phenylpiperazinyl-butyl)oxindoles as selective 5-HT7 receptor antagonists". Journal of Medicinal Chemistry. 51 (8): 2522–32. doi:10.1021/jm070279v. PMID 18361484. ↑ Doleviczényi, Z; Vizi, ES; Gacsályi, I; Pallagi, K; Volk, B; Hársing Jr, LG; Halmos, G; Lendvai, B; Zelles, T (2008). "5-HT6/7 receptor antagonists facilitate dopamine release in the cochlea via a GABAergic disinhibitory mechanism". Neurochemical research. 33 (11): 2364–72. doi:10.1007/s11064-008-9796-4. PMID 18663573.